Before leaving Dubrovnik, we’d managed to knock off the elusive items from our shopping list – and the tyre pump was most certainly needed, since we’ve managed to pick up a lively slow puncture on one front tyre. Sod’s law, of course, says that this is the first country we’ve been in for a few that’s had good enough roads not to need an extensive national network of dirt cheap little roadside tyre-fixing shacks. And so, with arms aching from using the bicycle-style “track pump” (it might be manual, but it’s a lot quicker than a little ciggy-lighter powered compressor! ), we headed northwards. Croatia’s a funny country, in that the top and bottom of the country don’t actually meet in the middle. There’s the Bosnian seaside acting as a belt – all 15 miles of it. There’s an agreement in place between the two countries to enable easy transit across, but a googling on the subject of our old friend, insurance green cards, didn’t exactly settle our minds on the subject. We would probably be able to cross easily, with minimal border controls. Just sit back, and bimble along from border to border. But what if something went wrong? We’d be technically uninsured. Would it be an issue or not? Of course, it all becomes academic rapidly once you look at a map, since Croatia’s got a lot of offshore bits. There’s a sizable peninsula, Pelješac, sitting alongside the Bosnian corridor, with a ferry back to the mainland on the northern side. 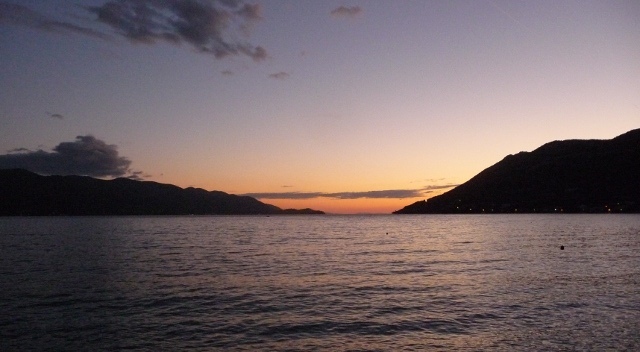 And, even better, Pelješac is a nice place, whilst it sounds as if Neum (the Bosnian seaside town) is somewhat less so. Why even worry about it? The first place you come to on Pelješac is a little town called Ston. Actually, it’s two. Ston and Mali Ston (Little Ston). 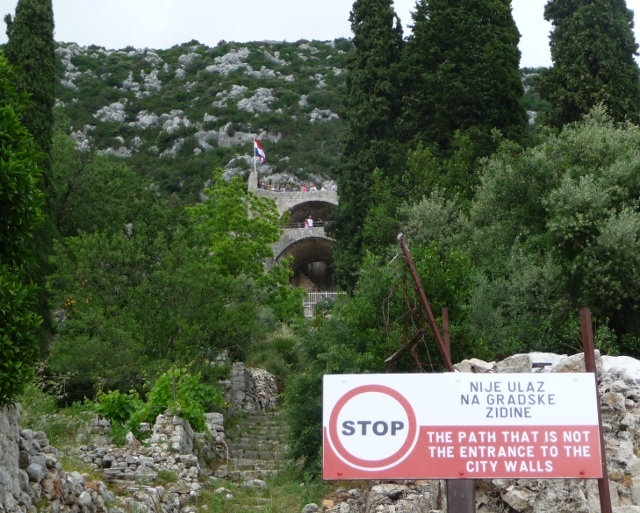 They used to form part of the northern boundaries of the Dubrovnik Republic, many moons ago. As part of the fortifications, there was a wall built across the neck of the peninsula, between the two villages, and it’s still there, snaking across the mountainside between them. The tourist board make proud claims of it being the second largest wall in the world, after – of course – the Chinese Great Wall. Clearly, they’ve not heard of Hadrian, but that’s a side issue – it’s still a vaguely amusing claim. I noticed something on the BBC news earlier that the Chinese wall’s now reckoned to be 21,000km long. The Ston one’s 5km. Bless. From there, we snaked up the peninsula, with some great views alternating from coast to coast whenever the damp low cloud permitted, across to the islands or back to the mainland, before arriving at Orebić. Just after Orebić, we found something that we’ve not seen for many months – campsite row. As the single-track road wound along the waterfront, a misplaced tyre to the left would have put you in the water. A misplaced tyre to the right, on the other hand, would have seen you registered as a camper in any one of a dozen sites. Some were big. Some were small. Some were full. Some were probably closed. Some looked awful. We found one that was basically a small meadow, and pitched under an olive tree, with just enough space in front to give us separation from the road, but leave us with the splash of waves against the rocks all night. Idyllic. We decided not to take advantage of the myriad opportunities to learn to windsurf (re-learn, for me) or kitesurf along this stretch, tempting though they were. Instead, we found ourselves cycling back into Orebić and getting the foot passenger ferry over to Korčula town. We could have taken the van on the car ferry, but the ferry prices aren’t cheap. Given the amount of islands we’d love to hop between, they could start to add up scarily. 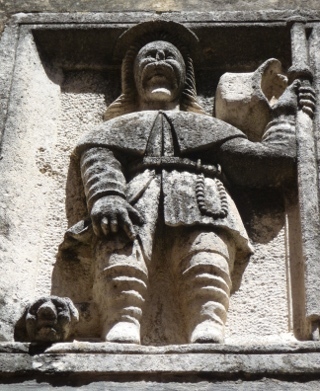 Korčula town, alleged to be the birthplace of Marco Polo, is a small pimple on the coast of the island, which over the centuries has been turned into a little fortified outcrop. More recently, of course, this has turned into a little tourist haven. We realised just how much when we got onto the ferry, sat down – and shortly after it cast off, the crew started looking baffled and double-checking passenger headcounts. Eventually, the question was asked – “Are you all part of the group?” Umm, no, what group? We’d managed to gatecrash a tour-group of Germans, nicking two seats on their privately chartered boat. Ooops. Still, they were kind enough not to throw us overboard (as some were suggesting… Proof that Germans do have a sense of humour. I hope.) and only charged us the same price as the ferry would have done. The old town is, of course, beautiful. The streets are laid out in a kind of slightly herring-boned grid, allegedly to provide maximum shade from the sun and cooling effect from the breeze. Most of the streets are still residential, but – of course – with many small restaurants, bars and shops dotted in amongst. We chose one of the small restaurants as a place to prove the shade and cooling breeze theory. It worked, too. Oh, yes, and they served some really rather wonderful lunch – we just grazed, a couple of bowls of fish soup, a couple of portions of fish pate, and then a single shared main course – prawns in an utterly delicious soy, garlic and cognac glaze. After a wander, during which we realised that the chuffin’ great big cruise liner moored all along one side of the town was one of the ones we’d seen in Kotor a week or so previously, it was time to reluctantly head back to the (right) boat to Orebić. Finally, we headed up to the top end of the peninsula – climbing, climbing, climbing up and over the tops again, to a small harbour village, before winding our way back, almost to Ston, and turning towards the ferry back to the mainland. It wasn’t long before we came across the little town of Drvenik, and a ferry that we’d thought didn’t exist – over to the island of Hvar. This entry was posted in By Country - Croatia, Food stuff, Travel stuff, Van stuff. Bookmark the permalink.